As I have noted before, white nationalists like Steve Bannon and Stephen Miller want to flip the script on how we view immigrants and refugees in this country. They want us to stop us considering their plight and start being afraid of what immigrants and refugees will do to this country. The legal and illegal population of foreign-born immigrants living in America will break a 100-year-old record in just six years — and will continue to smash records for the rest of the century, according to a new analysis of U.S. Census Bureau data. None of the links provided by the Washington Examiner go to actual studies conducted by Camarota or CIS. Camarota did publish an article at CIS in June 2013 which made these claims about an immigrant surge. It was titled “Foreign-Born Share Would Hit Historic High in Seven Years Under S.744.” He was referring to the Comprehensive Immigration Reform Bill crafted by the so-called “gang of eight” that passed the Senate but was never brought to a vote in the House. MPI also provides us with this chart showing the U.S. immigrant population and share over time. Data on the nativity of the U.S. population were first collected in 1850. That year, there were 2.2 million immigrants in the United States, representing nearly 10 percent of the population. Between 1860 and 1920, the immigrant share of the overall population fluctuated between 13 percent and nearly 15 percent, peaking at 14.8 percent in 1890, mainly due to high levels of immigration from Europe. Restrictive immigration legislation in 1921 and 1924, coupled with the Great Depression and World War II, led to a sharp drop in new arrivals. As a result, the foreign-born share steadily declined between the 1930s and 1970s, reaching a record low of approximately 5 percent in 1970. 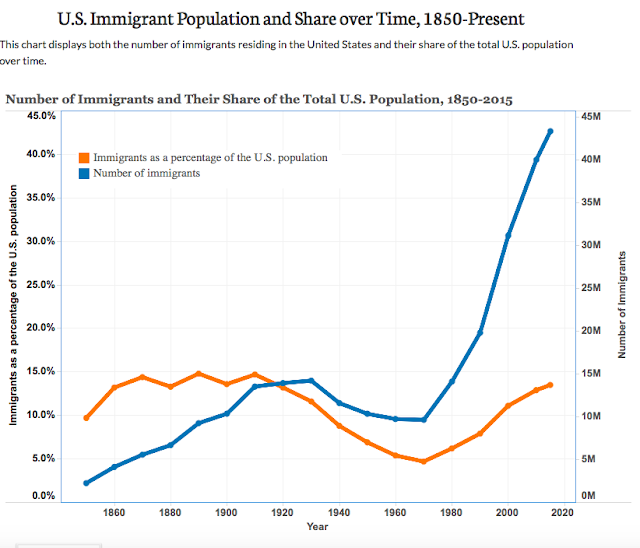 Since 1970, the share and number of immigrants have increased rapidly, mainly as a result of large-scale immigration from Latin America and Asia made possible by the abolishment of national-origin admission quotas by Congress in 1965. In other words, nothing significant has changed about immigration policy since 1965 that would lead to the kind of fear-mongering we’re seeing from the right (other than the race of the majority of immigrants, which has gone from White to Black/Brown/Asian). While the number of immigrants in this country continues to rise, their share of the population is still lower than what we saw prior to the Great Depression and WWII. This campaign to stir up fear of immigrants is nothing but white nationalism dressed up in 21st century clothes. It consists of nothing more than hate concealed in lies.